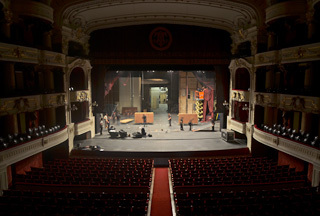 The world behind the stage of the Santiago Municipal Theatre is unknown. To understand it, it is necessary to visit and discover it structurally, functionally, humanly and emotionally. Anonymity is the characteristic that best describes the stage machinery and those that operate it, which has left this trade devoid of recognition, despite constructing a fascinating world, worthy of tribute. MONTAJE ANONIMO received an honorable mention in SANFIC and FICVALDIVIA in 2013 and has just begun to screen on the international festival circuit.